Here’s an eastern spadefoot, a medium-sized frog that is relatively common but rarely seen unless you happen to be trapping amphibians around an ephemeral pond. They’re burrowers, so they need loose, sandy soil that’s easy to dig into. They dig with their hind feet, backwards. The adults are rarely seen in daylight. They usually only come out of their burrows at night to catch bugs, earthworms, and slugs. 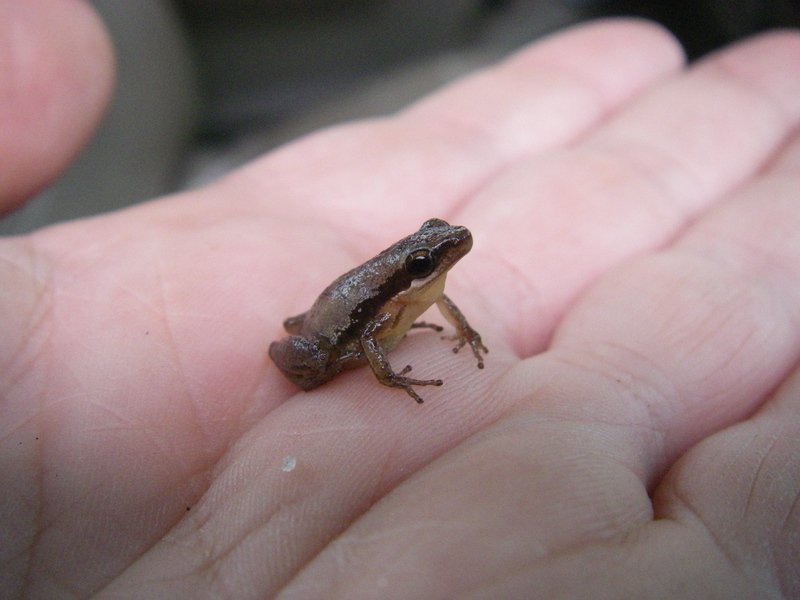 But you can sometimes find hundreds of tiny recently-metamorphosed spadefoots leaving a pond during the day. The easiest way to tell them from true toads (the Bufo genus — around here that would be the Fowler’s toad and the American toad) is their eyes — their pupils are vertical instead of round. They also have two curved yellow streaks on their backs. Also, they try to curl up into a ball when threatened. I’m not sure what threat would be deterred by this — definitely not a human — but it is adorable. Here, Internet. 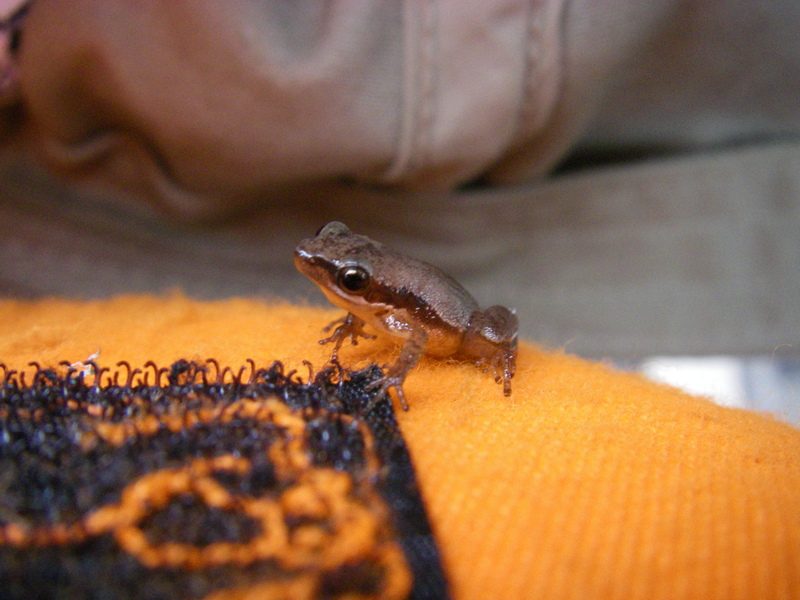 Have a tiny pinewoods treefrog from 5 years ago in Walton County, Florida. And here, me: a reminder that having a mostly indoor job doesn’t mean you can’t go hiking on weekends. In other news, I’m not dead, and neither is this blog. The hiatus just lasted longer than expected. More to come. Some animals live their lives on a strict annual timetable. Migratory birds set off about the same time each year. Hibernating animals start stuffing themselves and building up insulation-fat at the same time. Many species have reproductive cycles that match the seasons. But long before I lived in Florida, I lived in a much colder place: northwestern Pennsylvania. That area gets a lot of snow, and while they’re used to it, everyone is pretty sick of it by March. The earliest signs of spring are important. Spring there is announced by two sounds: the calls of Canada geese flying north, and the deafening chorus of spring peepers from every creek and roadside ditch that isn’t frozen. Last month, in a post about the green anole, I mentioned that it was able to change color. Anoles and chameleons are not the only color-changing animals. If you’ve ever caught a frog outdoors in cold weather and it seemed to get lighter as it warmed up in your hands, that wasn’t your imagination. Backyard Biology has a fantastic explanation of frog skin colors and how they can change. The ever-changeable, Gray Treefrog. How does it do it? Green is a popular color for frogs, and birds too, but that lovely green color doesn’t come from a green pigment as you might expect, but from the interaction of multiple layers of specialized color and light-reflecting cells in the upper layers of their skin.